They were as old as the very mountains themselves. Or at least that's the way they appeared to my 8 year-old self. King and Esther. Even their names sounded ancient. King was a poet and storyteller - the consummate mountain bard. Esther was weathered, bent and looked as though she had been born of the hills she called home. We came to be their closest neighbors (about 1 1/2 miles away) when I was almost 8. Wary of newcomers, they quietly watched us from a distance until finally deciding that we were a special gift sent from heaven to amuse them in their golden years. King and Esther homesteaded the land that we now called home. King remembered logging our piece of property with a team of horses when he was a young man. In fact, a number of corduroy roads* still stood in the low spots that had been too muddy for the horses to drag logs through. King showed us a shallow, wide hole behind our outhouse that had served as the garbage dump for the horse-loggers some 75 years before. We kids found it a never ending source of treasure, always yielding at least one more artifact to add to our collection. Our barn originally stood near King and Esther's home. It had been King's parents barn, housing work-horses, cattle and the family milk cow. 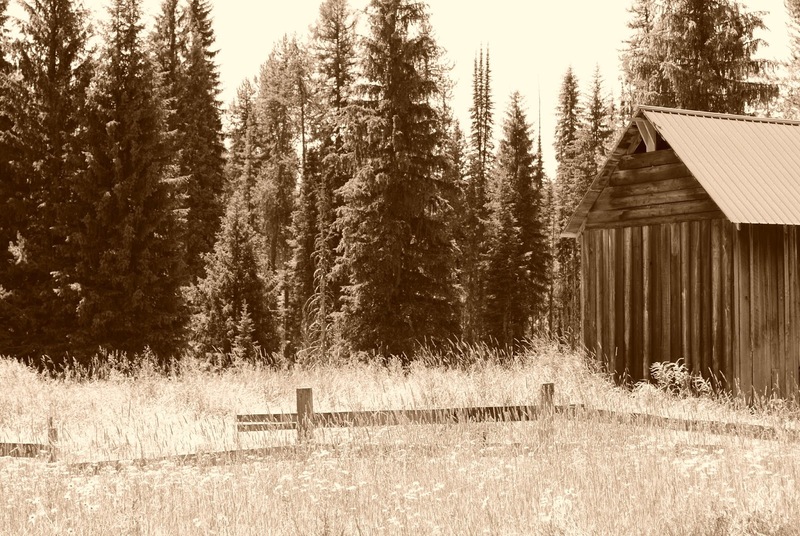 The barn had been standing empty for years, gathering wasp nests and spiders. Needing a dry place to store hay, along with a place for our horses to get in out of the weather, my dad struck a deal with King and the barn became ours. It had been built on skids, so moving it, although a huge project, was do-able. Inch by inch, that barn was pulled up our driveway, to find a new home in our field. The first obstacle was our front creek, with a wooden bridge that King, himself, had built many moons before. Passing that hurdle, the barn wound around our "sledding" hill, was pulled through our only low-spot and finally came to rest on a small knoll not far from our hand-dug spring. Although we lived out in the middle of nowhere with no discernible growing season, Esther's garden never failed to be less than spectacular. Fenced to keep the deer out, Esther's garden was full to overflowing with every good thing. She had all of the cold-weather crops in abundance, along with tomatoes, peppers and even the occasional crop of corn. It wasn't until years later that I discovered Esther's secret for extreme cold-weather gardening - she started EVERYTHING in her south-facing living room in February. As a child, I never once took a seat in her living room. I couldn't! Every square inch of flat surface was covered with growing things popping out of small plastic containers. She nurtured those plants through the cold, long winter months, coaxing them into a cacophony of splendor bursting with goodness by the time harvest rolled around. Esther understood the ways of the mountains and the ways of the human heart. She was abrupt and straightforward, peppering her sentences with her most oft used phrase, "for such a matter". She knew the bone-wearying work that was required to carve out a life in the mountains and the soul-numbing loneliness that can overwhelm young mothers struggling to gain their bearings. One early October day, after a short visit in the warmth of Esther's kitchen, my mother gathered my brother and I and readied for the cold walk home. Eyeing her through steel gray eyes, Esther asked my mom when she had last been out of the house. Surprised, Mom said that she hadn't left home in over a month. She fed the animals, took care of us kids and had dinner waiting for Dad when he got home, but, other than that, she had no human interaction. Esther promptly informed my mother that she would be coming to her house at least once a week and Esther would teach her how to make a quilt. Mom politely made excuses, however, Esther quickly dismissed them and told her to be there the following week. That winter, my mother made her first, and only, quilt. She found out that "cabin fever" was real and that neighbors really NEEDED each other to make it through the long winters. As Esther and mom stitched and talked and laughed, an unlikely friendship formed. The weathered, gnarled pioneer woman found hope and energy in the greenhorn and the greenhorn found companionship and wisdom in the pioneer woman. Those friendships, formed in the heart of the mountains, lasted a lifetime. King and Esther are both gone now. Our days of playing pinochle at the kitchen table and sharing Thanksgiving dinner are alive in our memories only. But in my mind's eye, I can still see King directing the building of our "new" bridge, when the old one (that he had built years before) disintegrated. I can see him bent over with laughter after he taught my mother how to put on snowshoes (backwards) and watched her do a face-plant in three feet of snow. I can see Esther, face weathered to leather, smiling with a near toothless grin. King and Esther were building blocks of my childhood. They taught me that wisdom comes in unexpected packages. They taught me that neighbors are to be treasured. They taught my family country wisdom that transcends the ages. The very thought of them brings a smile to my face. I hope that every one of you have had an opportunity to know a "King and Esther". They are true treasures. *A corduroy road is a road built of logs laid horizontally, one butted right up next to the other. Horse loggers built small sections of corduroy road in low spots or muddy sections of road so that the wagons didn't get stuck and mired in mud. Most of our corduroy roads are gone now, although I have had the opportunity to show small sections of disintegrating corduroy road to my children. Thank you so much for this post. Though we moved around (military Dad) we were blessed with 4 years of Helen and Ernest. I was ages 6 thru 10. Your story reminds me of them. She taught me to make pickles, can tomatoes and be a better person. God bless all of them and their wonderful, sharing kind. I aspire to be that for my neighbor children some day soon. I never had the blessing of knowing such people. However, I intend to be that woman to anyone who can recognize her in me. Some time ago Enola you posted something else from your childhood, a story about your Dad's Dodge Power Wagon. I saw one yesterday, fully restored, late 1940's, early 50's or so in Port Aransas, Texas when I went to pick up my surf board yesterday. The Power Wagon was a shiny "Fire Engine Red"
That was the only problem with it, it was Red and not Olive Drab. If you guys find one up their in the mountains, buy it. Restore it and use it. It would be priceless as a farm vehicle. If I ever got one I would yank off that flathead engine and install a Cummins 12 valve diesel engine off a 1990 First Gen, Dodge Diesel Pickup. Instead of the 45-50 mile an hour top speed, that baby would rock out at 110 miles an hour and tow 20.000 pounds. What a richly blessed childhood you had. Memories of the wiser, older, teachers are precious. I, too, had such an opportunity to learn from the elders while growing up and it has been invaluable in my life. Thank you for sharing this, for your wonderful blog, and for all the valuable information that you post. What a beautifully written story! Thank you. Oh what a lovely story! Please share more about them. This could be the spine of a great book that you are called to write. We would enjoy reading more about their wisdom, life skills and coping ability. Then more about how they cooked, what they cooked, especially if it were a foraged food. An older woman who was influential in my 20's and 30's admonished me "A good cook is one who can make a good meal out of what she has on hand!" Having gone through the Depression of the 1930's and various hardships she saw hard work as the natural course of life.